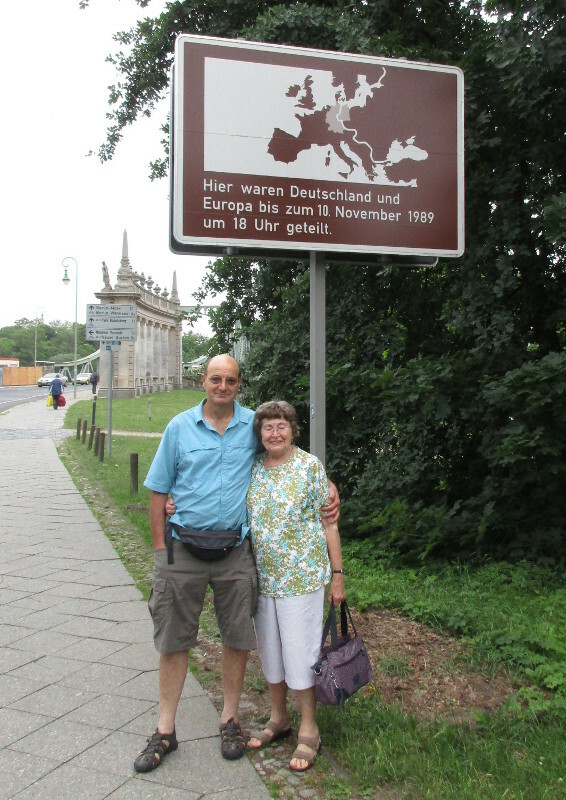 On leaving Premitz, we headed straight back to the river Havel and crossed over onto the Havel-Radweg again. 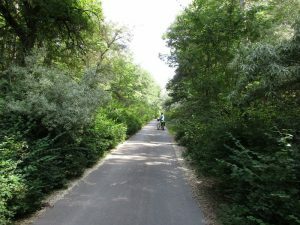 We cruised along this bike path for a large part of the day. The path took us past the site of an old Slavic castle from the 12th century before Rathenow. It was made of wood and earth, so nothing remains to be seen today. 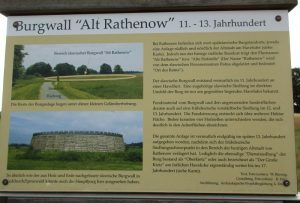 We passed through Rathenow, and then the smaller towns of Gottlin and Grutz. 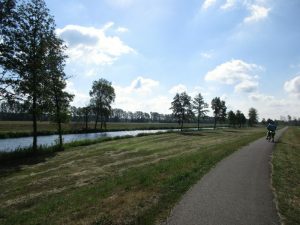 The bike path was easy and there were a fair number of other cycle tourists on it. We lost a spoke again at about 10am. Kris fixed it really quickly in 20 minutes and we were on our way again. 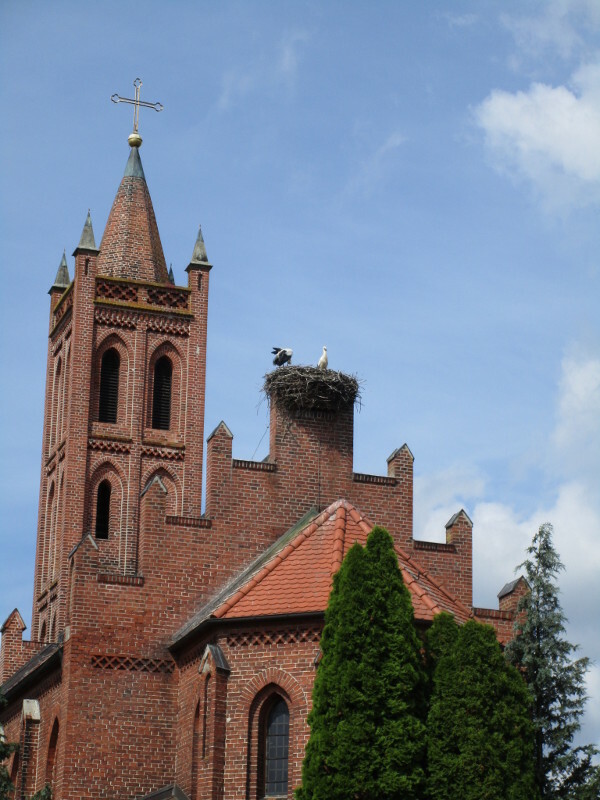 We temporarily lost the path and toured through this little town unnecessarily – but did enjoy seeing these storks nesting on a church. 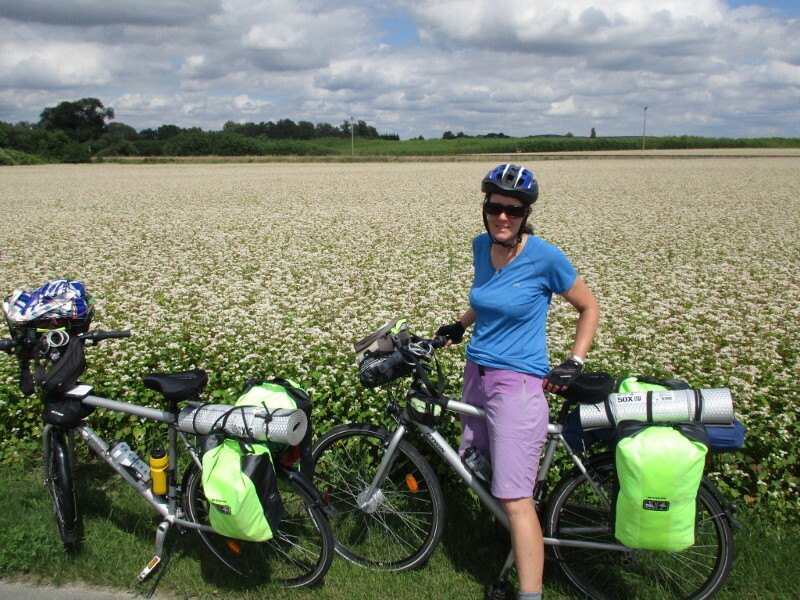 We asked for directions and got back onto the route, which took us through wheat and corn fields. Finally we reached Havelberg – which was interesting and scenic because part of the town is built on an island in the middle of the Havel river. 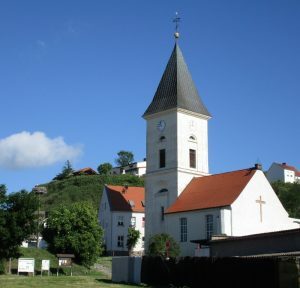 We had planned to eat something here, but the supermarket was up a hill, so we continued on. 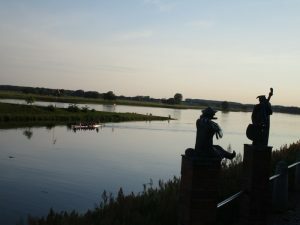 The river Havel joins with the river Elbe just after Havelberg. 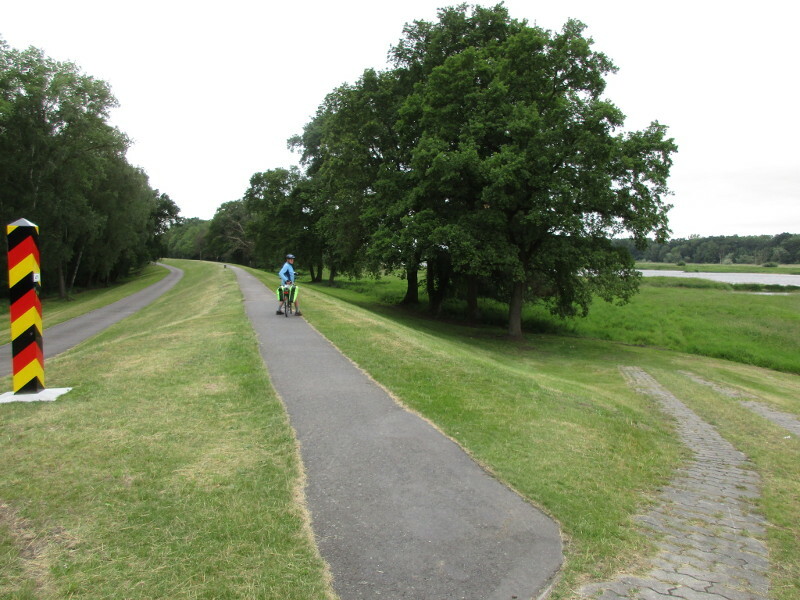 We had a choice of three different bike paths, one on either side of the river and one in the middle. We took the middle one and rode along tracks and stop banks with a river on each side. This was the scenic highlight of the route. We were getting very hungry and running out of energy by the time we reached Rühstädt, so we stopped to eat some bratwurst with mustard at a Gasthaus. This was a really cute and neat little village with lots of references to storks around the village (including the name of the Gasthaus) and some live storks nesting on roofs. Evidently the town is a “European Stork Village” with an unusually high stork population and storks are honorary citizens. 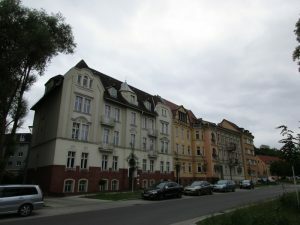 From here it was not far to Wittenberg and our accommodation. 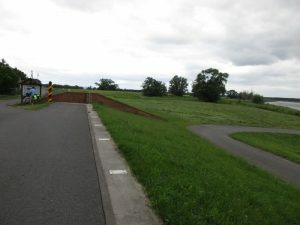 However we had a longish bike road detour (on a dirt track) as they were doing earthworks on the stop bank. 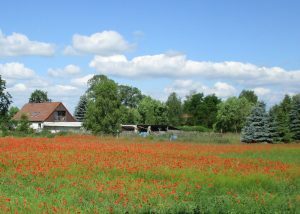 There was no one at our accommodation when we arrived at around 4pm – we were hot and tired and a little grumpy about it. This was the longest ride of our trip – at 110km. We tracked back to the tourist info and they phoned the accommodation – the people had arrived back so we returned. 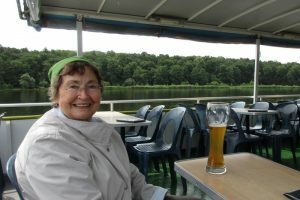 In the end it was fine and we were able to drink a beer with the proprietor to cool down before showering and washing our clothes. 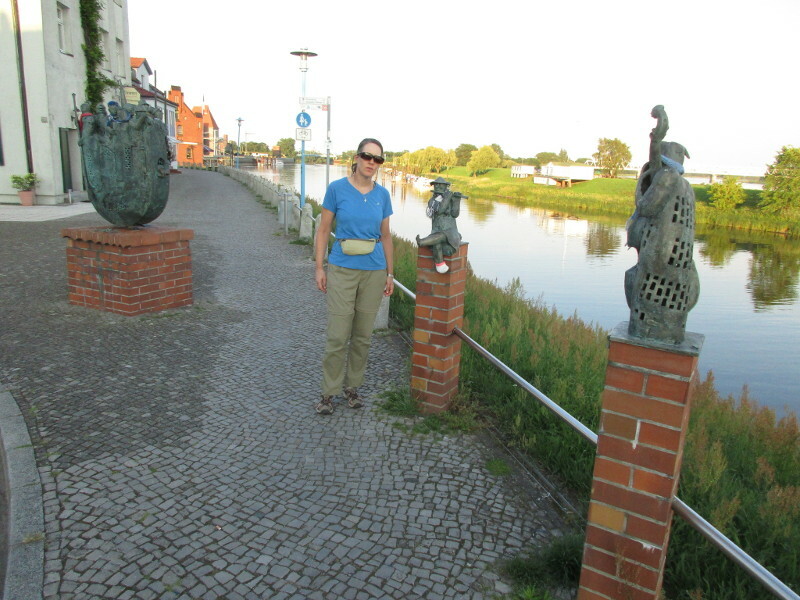 We walked around Wittenberge in the evening as it began to cool down. There was not much activity in a couple of beer gardens near the river. 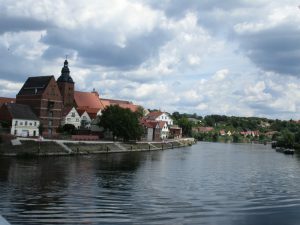 Wittenberge used to be in East Germany. 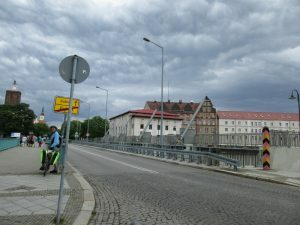 Today there are a lot of retired people living there, the main tourists are cyclist tourists like ourselves. We ended up just eating a pizza at the local pizzeria. Today we set out again for the last section of our bicycle tour – from Berlin to Hamburg. 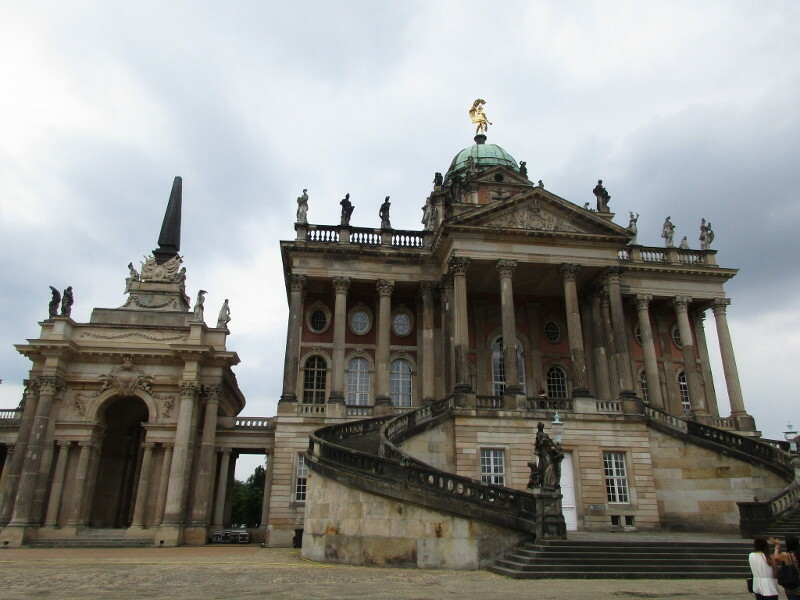 This morning we took the S-bahn train out to Potsdam, which is as far as the line goes, and cycled from there. There was a light rain for the first hour, but luckily it never got any worse and we didn’t need to take out our rain gear. We rode past the Neu Palace in Potsdam, seeing it for the second time. 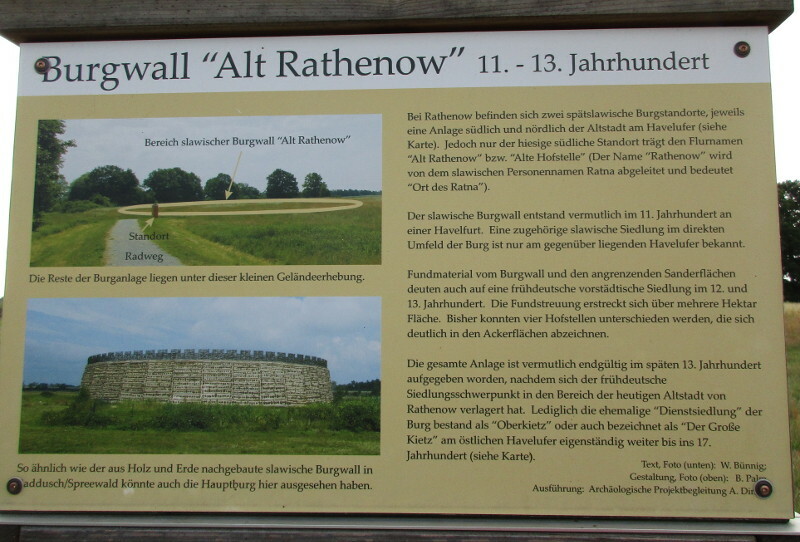 We had walked around it with Elsbeth a week ago. 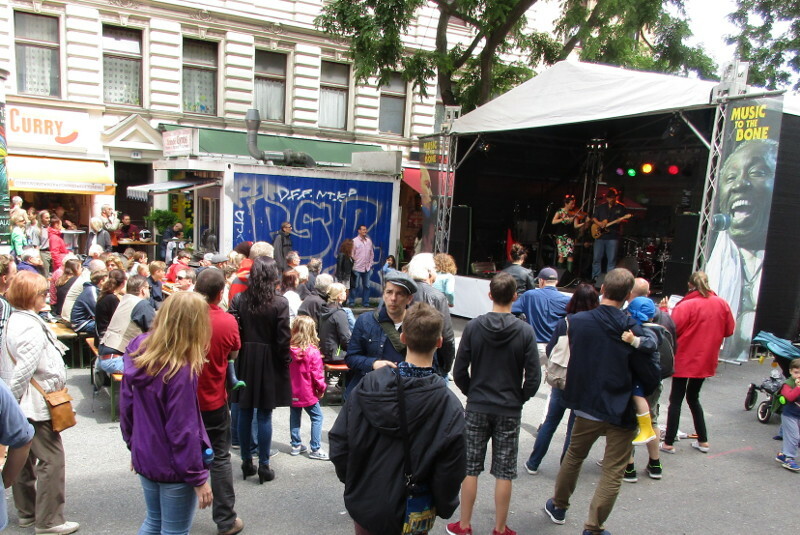 Our next big town was Werder and then Phoben. 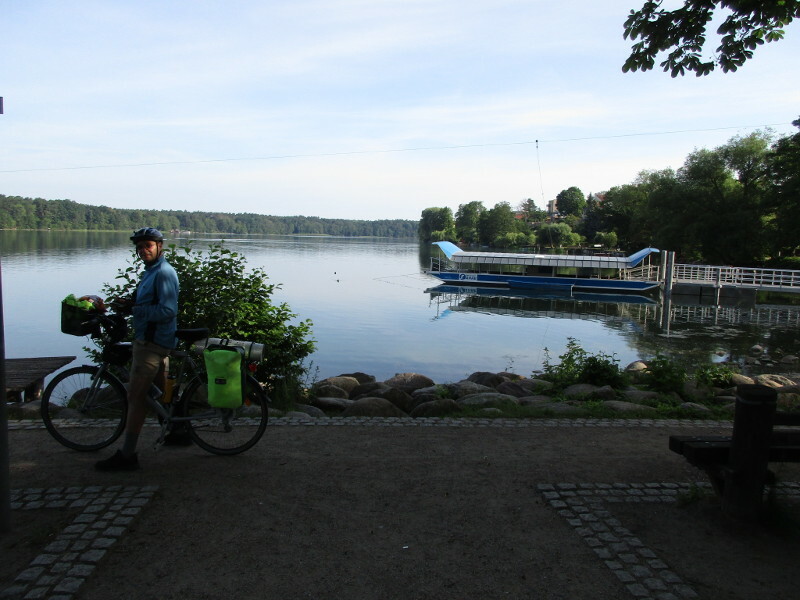 There we got onto the Havel bike route and that took us almost all the way to Brandenburg. 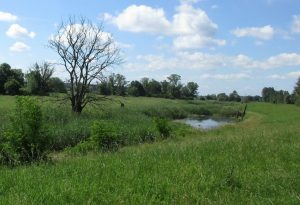 It was a beautiful route, alongside the river and wetlands. 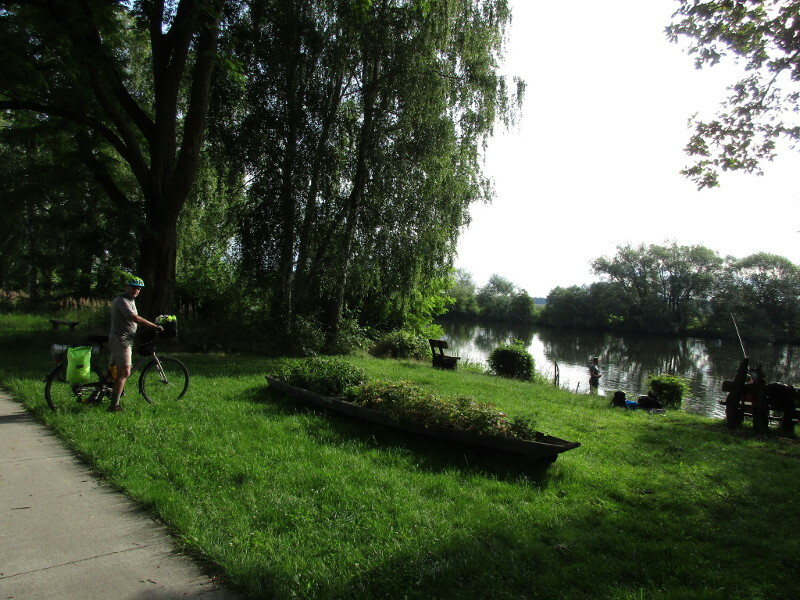 There were also a lot of insects again – all our itchy bites had healed up during our Berlin stay and now we were stung again – after we stopped for a mid morning snack and break at this lovely spot. 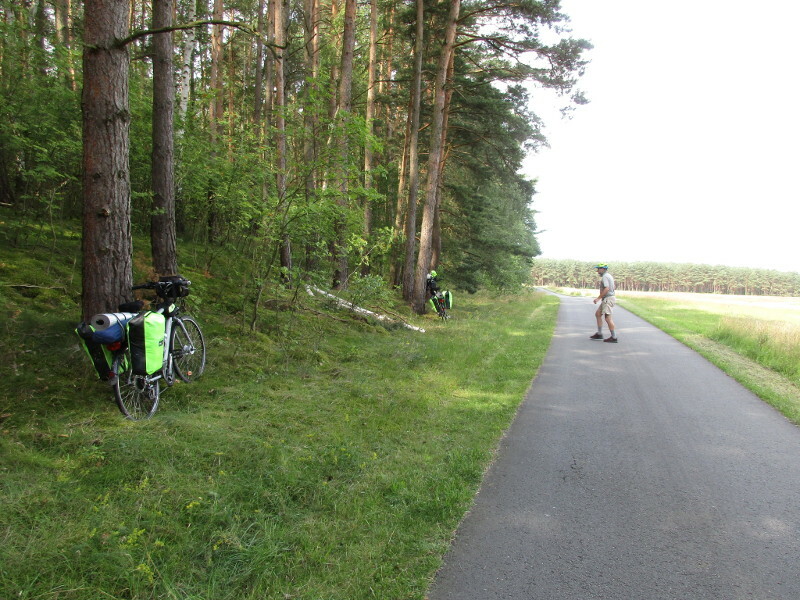 The mis-hap of the day was Kris breaking a spoke just about a kilometer from Brandenburg. This is only the second incidence of broken spokes on this trip. To our dismay, we couldn’t find our socket to remove the rear cassette – a vital tool without which we could not replace this spoke. 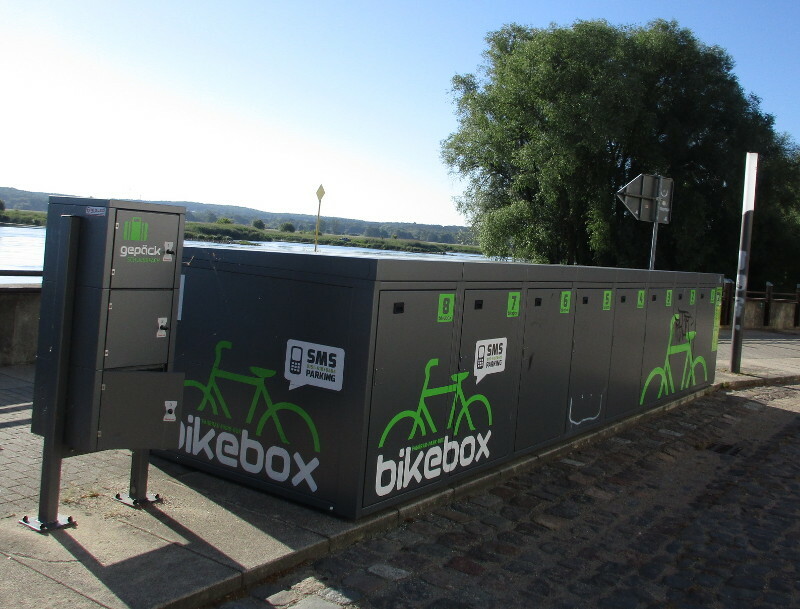 We rode into the town and found the nearest bicycle workshop. They wouldn’t sell us a tool and they were too busy to replace the spoke for us. 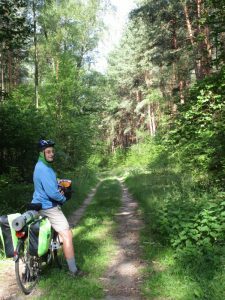 However they were quite friendly and did lend us their socket, so Kris replaced the spoke in the parking lot. We then went to Tourist info to get the addresses of other bicycle shops. 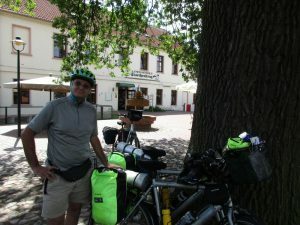 The first one we went to did sell us a socket – we hope there will be no more broken spokes this trip, but you never know. We ate some ice cream and pastries in Brandenburg, and then continued on the journey. 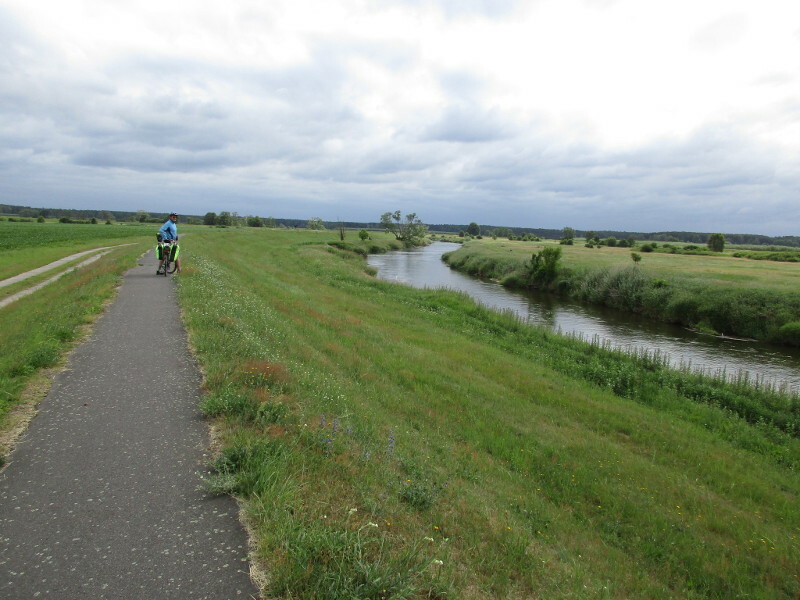 The ride after Brandenburg was less scenic, on a mixture of bike paths and small country roads. 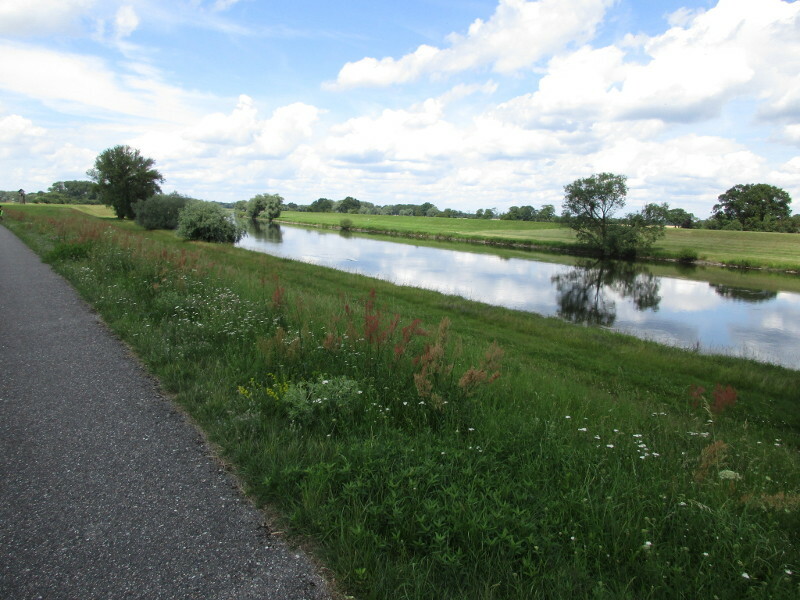 We got back onto the Havel river cycle route and rode through Briest and Teickaw. 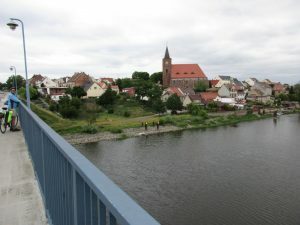 From here we departed from the official route to ride on the north side of the river to our destination for the day – Premnitz (a shorter route). In all, the day’s ride was 94km long. We stayed at the Hotel Super Bowl in Premnitz. It is a small hotel alongside a bowling alley, where we drank beer and watched the locals bowling. 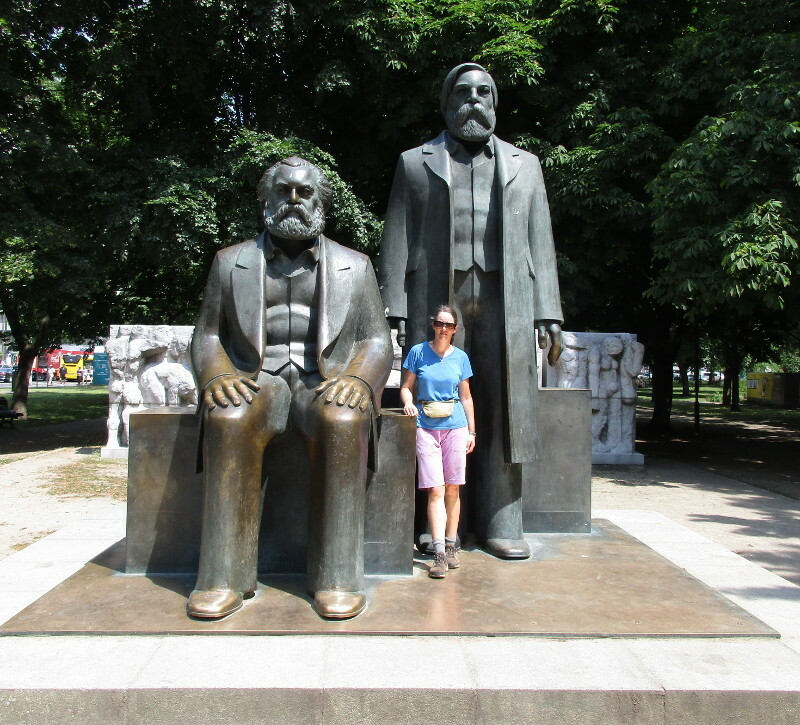 We had a change of pace and break from cycle touring to spend time in Berlin and environs with Elsbeth. 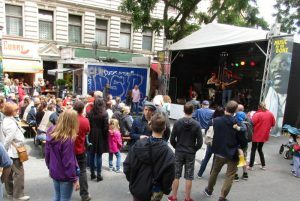 Here are photos of some of the highlights. 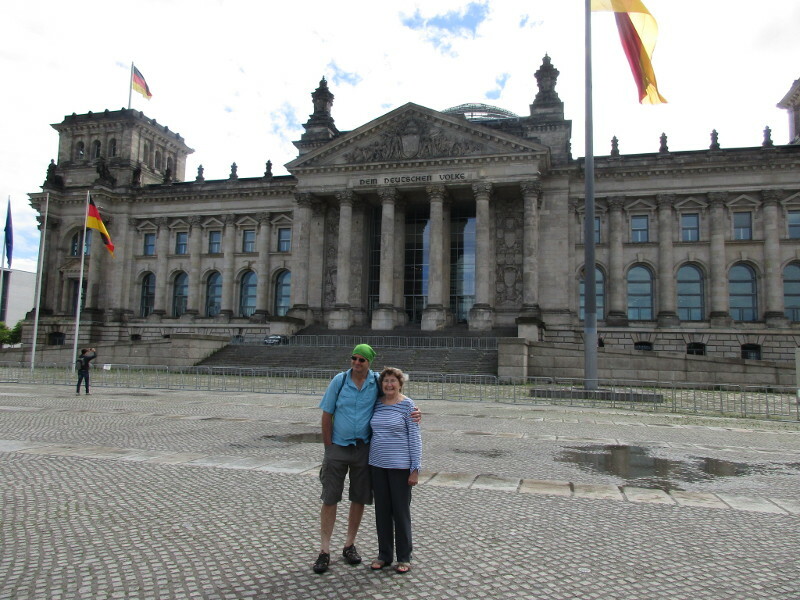 Today we made it to Berlin, where we are stopping our cycle tour for a couple of weeks to spend time with Elsbeth. 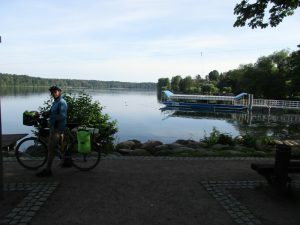 We first rode around the Straussee lake on our way out of Strausberg. 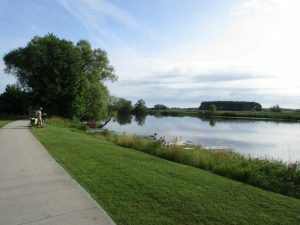 It was very scenic and fresh, and we spied a few people having their morning swim in the lake. 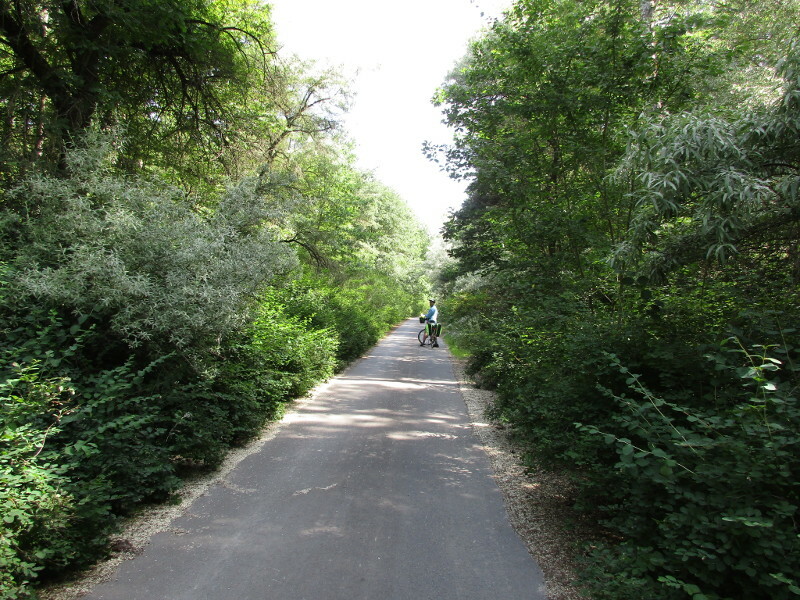 We then spent some time riding through forested areas. 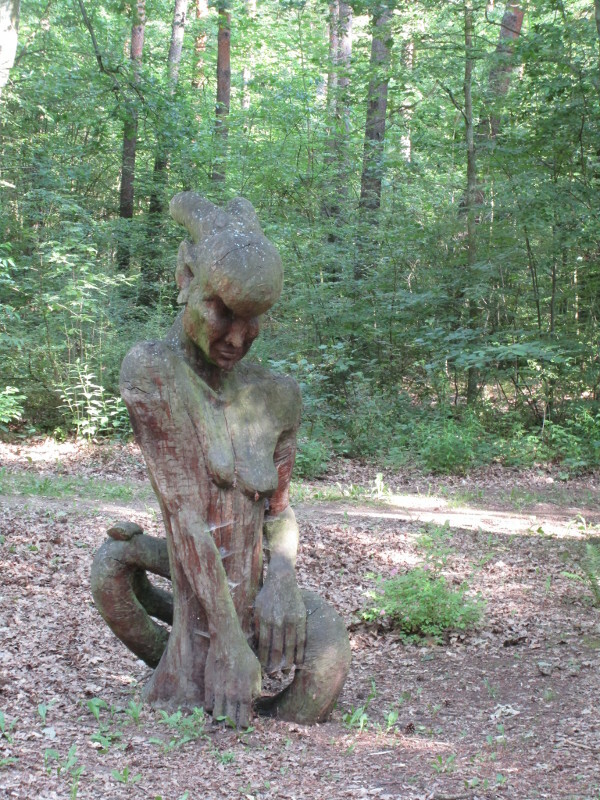 Once we got out of the forests, we began to make good time. We noticed that Kris’s back tire was worn through to the inner sleeve. We decided to change direction and go into the center of Berlin (Alexanderplatz) rather than skirt the city to our accommodation in the north. 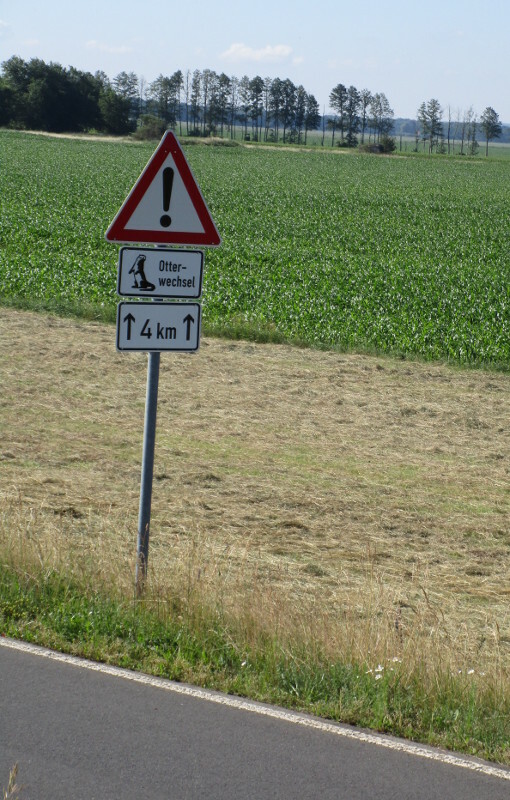 We knew there is a big Decathlon there, so we planned to get a new tire fitted. 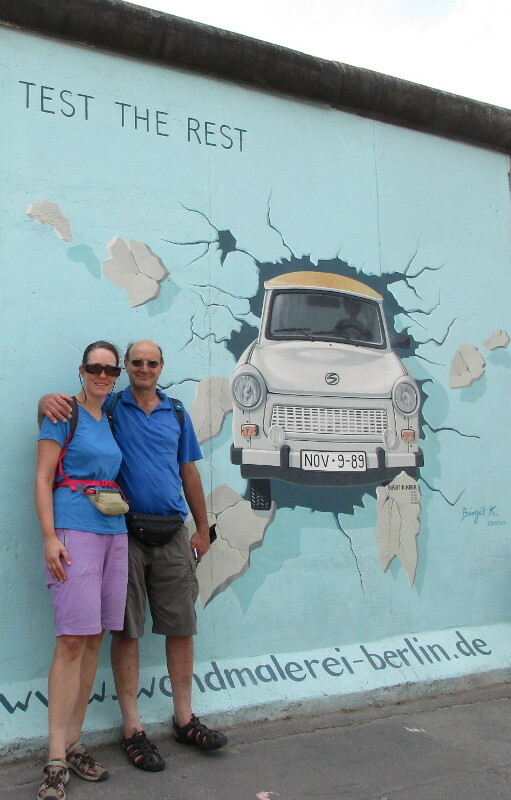 Luckily the tire held out – on our previous trip Kris had the experience of a tire bursting. As in most large German cities, it was easy to ride through to the center, Berlin has good cycling infrastructure with cycle paths alongside most of the bigger streets. We had Decathlon fit the tire and had to hang around for an hour or so, so we walked around the Alexanderplatz area. Then we cycled through to our accommodation in Birkenwerder in the north of the city. Riding north was interesting, we left the tourist route and rode through some very cosmopolitian areas, some a bit rough with a lot of graffiti on the walls. There were many different ethnicities in the city and also some lovely streets with lots of cafes and little shops. The city is BIG! Part of our route out of the city was alongside the Berliner Mauerweg (Berlin Wall Trail), which runs along former Berlin wall patrol roads. 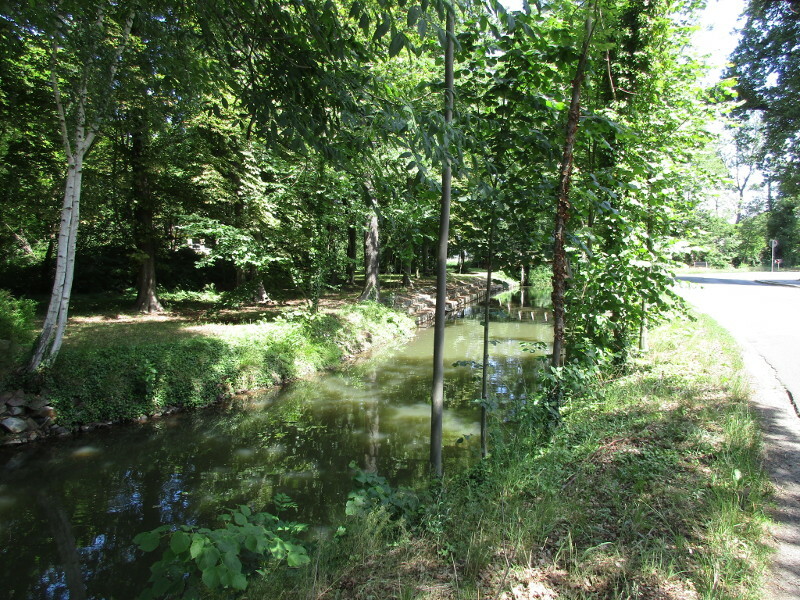 It was a nice park-like area, so close to the city. The total distance of our ride was 87 km. 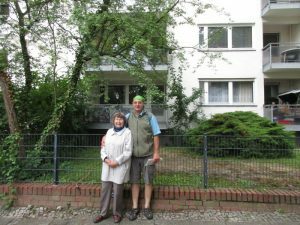 The accommodation was a unpleasant surprise – we had expected a ground floor flat, as the AirBnB site stated “garden apartment”. 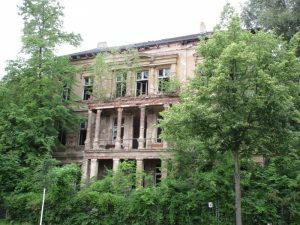 When we got there we found that it was in a cellar apartment, with steep stairs. It also had a toilet pump that was a bit smelly and started up each time water was used. 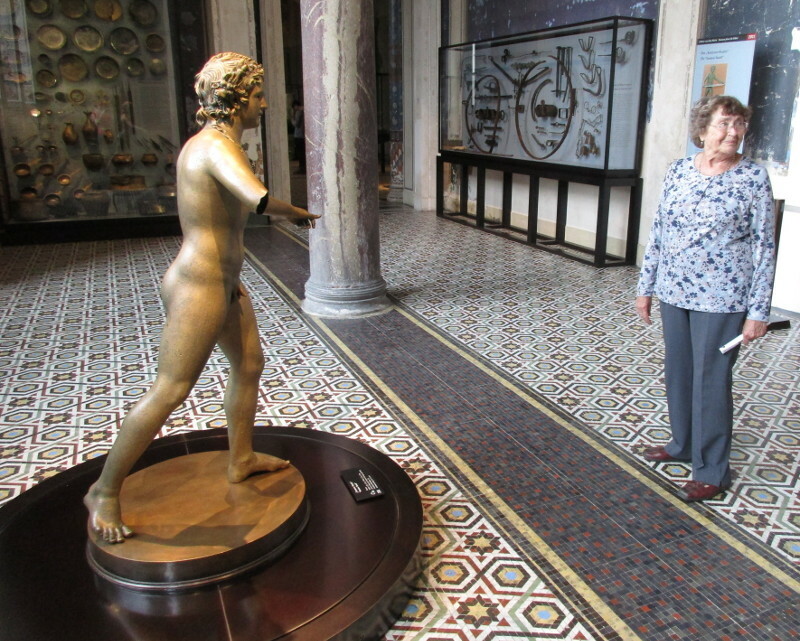 The stairs would be a problem for Elsbeth, so we stayed up late trying to find an alternative. I was very lucky to find another AirBnB apartment in Lichtenfelde (south west of the city). 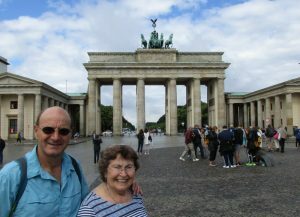 Luckily we could cancel the initial accommodation without too much expense, so we only stayed there for the two nights until Elsbeth arrived from London. Today was such a short and easy ride it was almost a rest day. 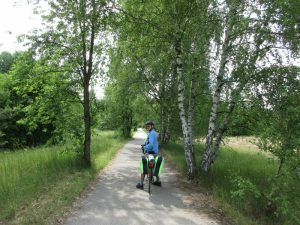 We rode just 40km on the Oder-Neisse-Radweg – from Frankfurt (Oder) to Kostrzyn. 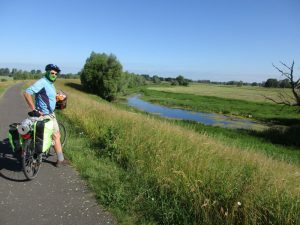 We set off early, as we knew it was going to get hot later on. 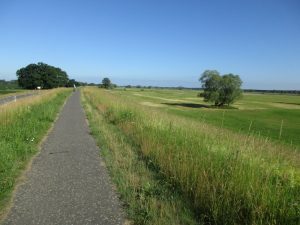 It was pleasant in the morning, though there were many flying insects which can be nettling. 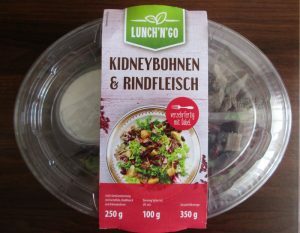 Both Kris and I are suffering from a number of bites over the past few days. 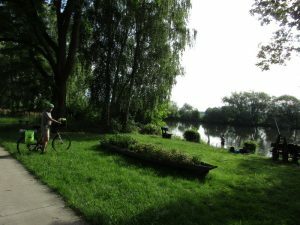 The first part of the ride took us a little away from the river, on some nice shaded paths – then we came alongside the river riding on the stop banks again. 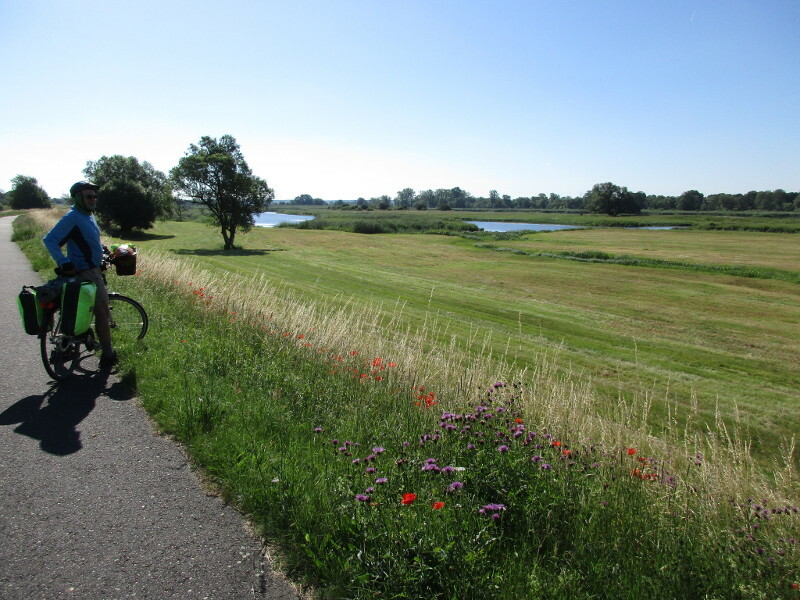 The river and flood plain are a lot larger than when we first started riding alongside it yesterday. 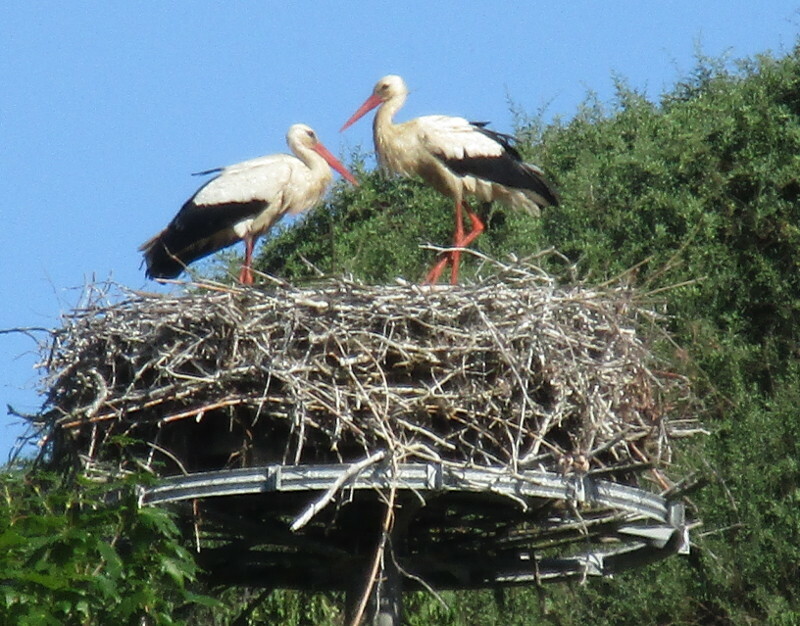 We saw some nesting storks again at Lebus. 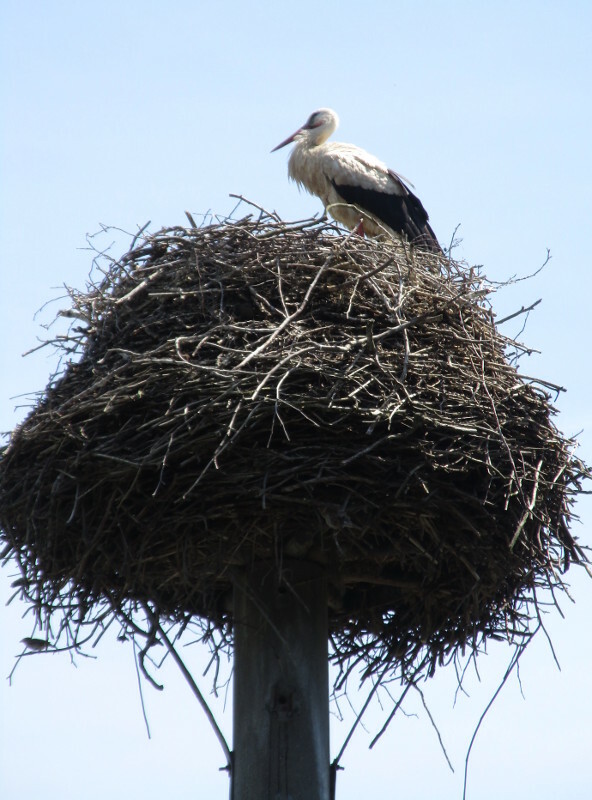 I always stop to take photos of storks I am particularly happy with how this one came out. 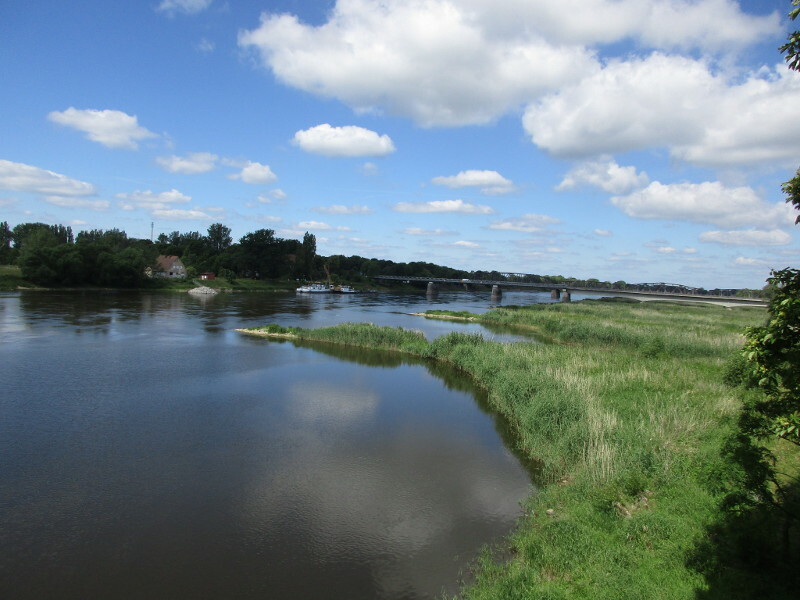 Our hotel in Kostryzn is in Poland, just across the river-border. 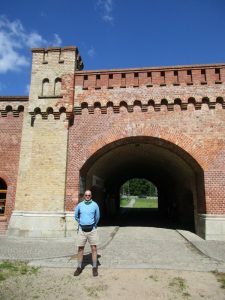 It is also next to a ruined fortress and abandoned town, which are the main tourist attractions of Kostryzn. The fortress lies on land at the confluence of the Oder and Warta rivers. 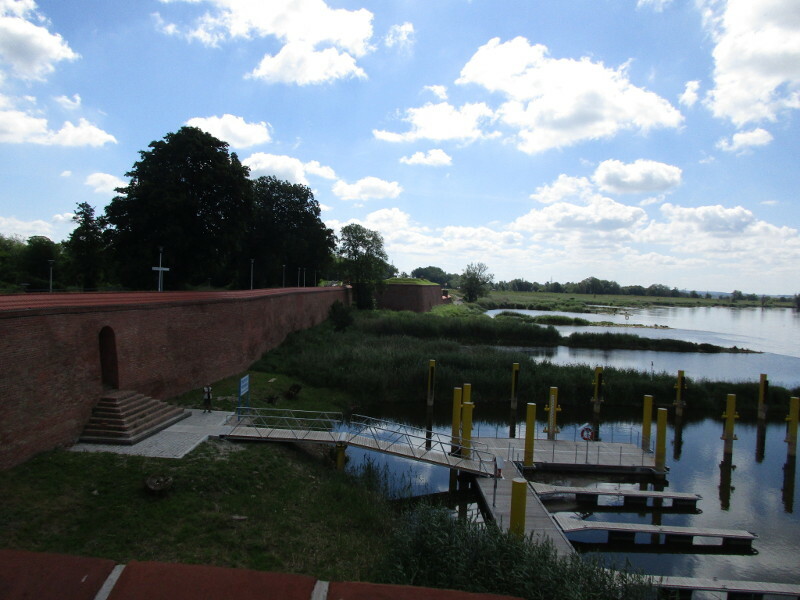 It was one of the greatest fortifications in Europe after its completion in 1590. 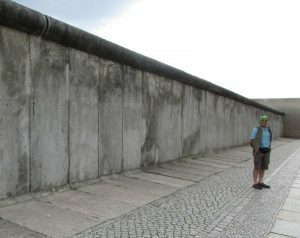 It was conquered for the first time in 1806 by Napoleon’s army. 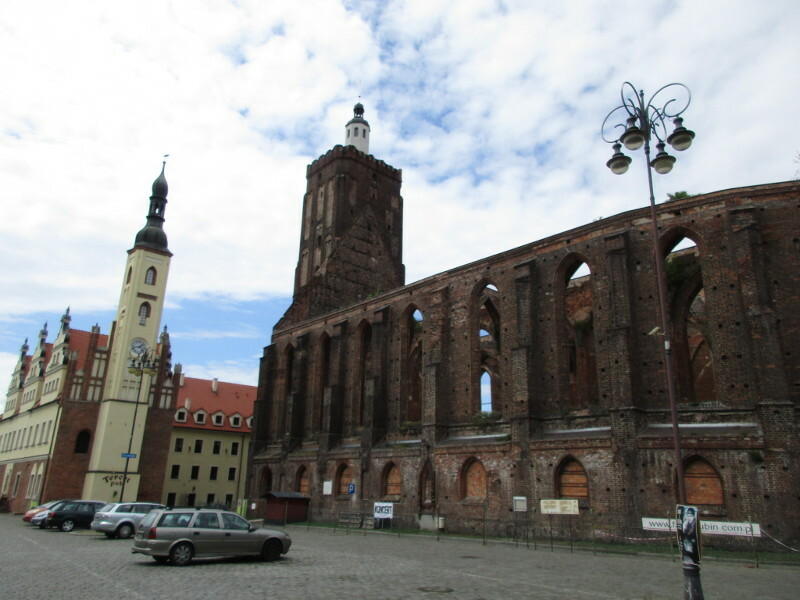 And almost completely destroyed by the Red Army in 1945, together with the neighbouring town. The town and fortress have not been restored. 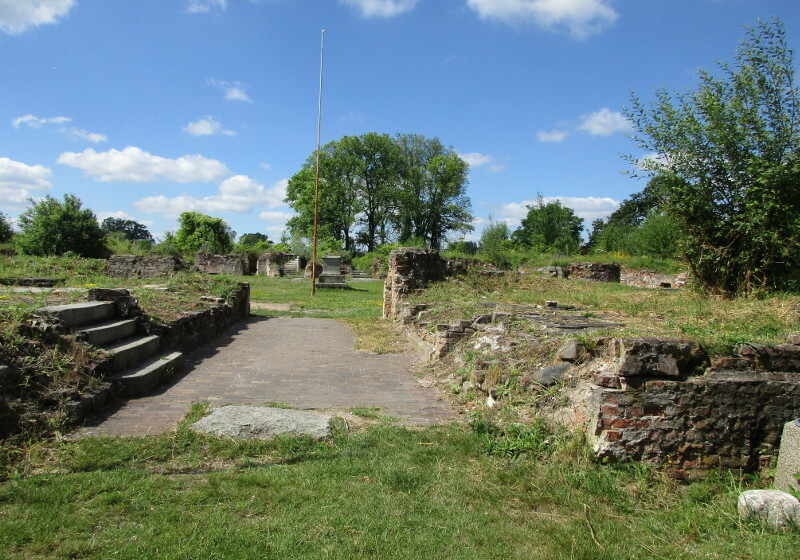 All that remains of the fortress are some gates, ruined foundations and bastions along the river. All that remains of the town are cobbled streets and building foundations, overgrown with trees. It is a strange place to wonder around in. It was hot and humid and the place was teeming with biting insects. 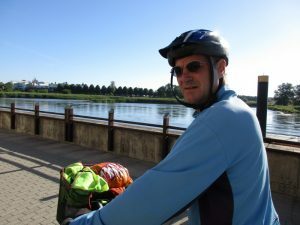 We rode around the new city, on the other side of the Warta river (for about another 10km) – we were searching for an old town, but there was not much to see. 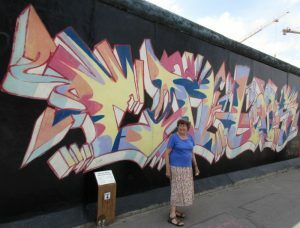 We went through a market with lots of stalls selling cheap cigarettes and brick-a-brac of all sorts just on the border – it was under canvas and felt like being in a maze we would never escape from – hot and humid. Our hotel has a 24 hour restaurant where we had some very nice goulash soup and some (not so good) Polish beer. 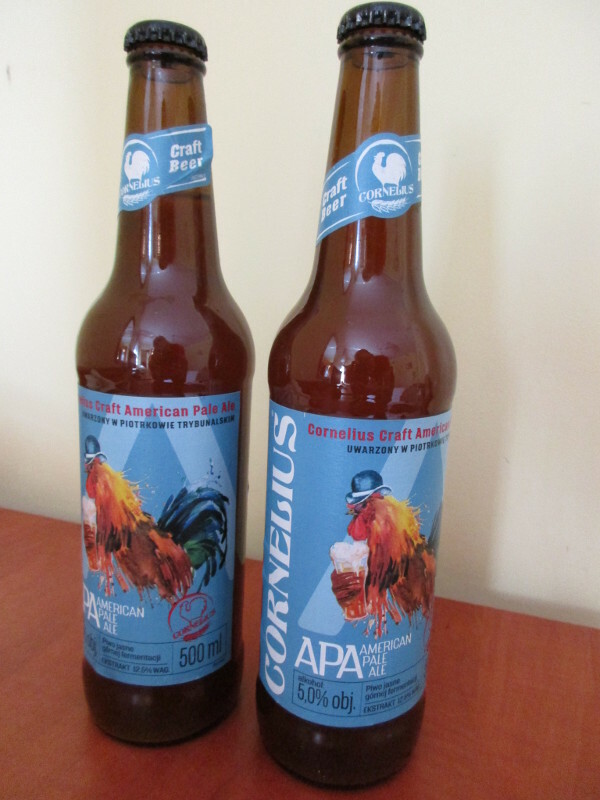 We unexpectedly found a good Polish APA (beer) at the Kostryn supermarket, which we had in the room later. Today we spent the whole day on the Oder-Neisse-Radweg – which follows the river north – from Guben to Frankfurt (Oder). The cycle path was easy to follow and sealed the whole way. 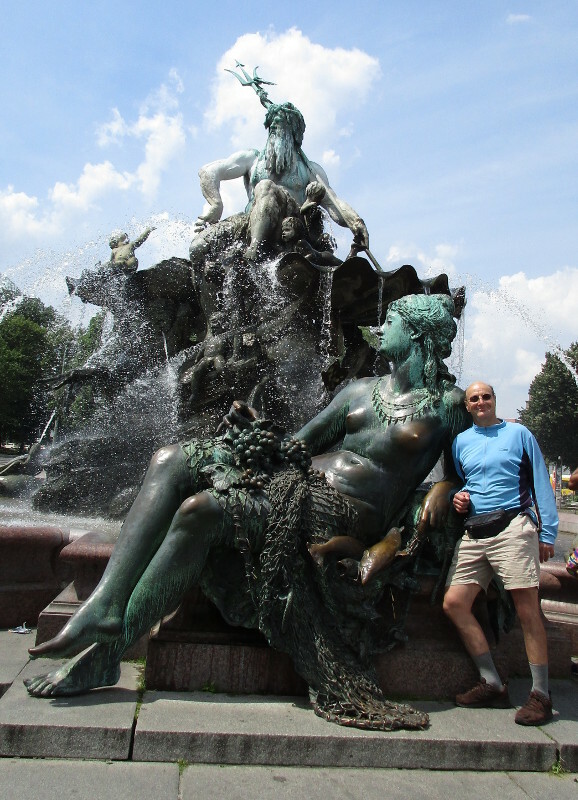 It was also nice and cool – the possible showers forecast didn’t eventuate. 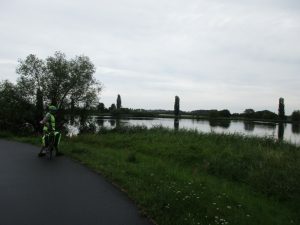 The only thing that was not perfect was a strong headwind, especially on the unsheltered stop-banks – adding to the exercise value of the 75km ride. 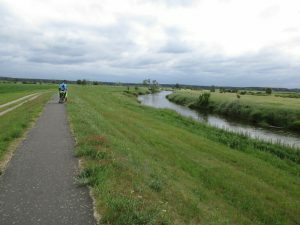 The river is the German/Polish border – the cycleway is on the German side – we rode alongside these German border posts for much of the day. We were impressed with the mobile high-water dike at Ratsdorf – Locals just need to slot in the barrier when the river floods. 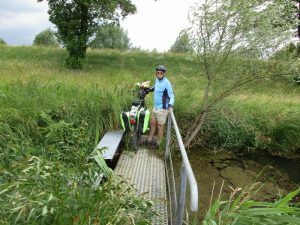 A canal joins the river at Eisenhuttenstadt – after we crossed it we lost the bike path for a while – but Kris quickly found it again and the path reverted to easy cycling alongside the river once again – alternating from riding on top of the stop bank with riding alongside it. 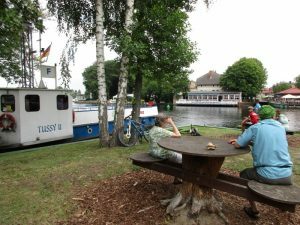 We stopped again at Aurith, as we couldn’t resist a cute cafe/bar set right alongside the cycleway – to share a Weizenbier. The last ten kilometers or so into town seemed to take forever – the cycle path left the river and after a messy transition (not sign-posted!) picked up again alongside the main road into town. 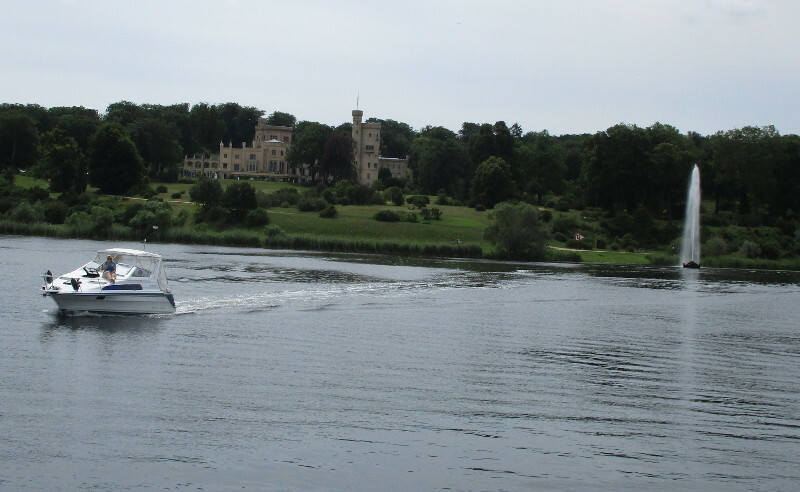 There were some beautiful homes alongside the river riding into town. 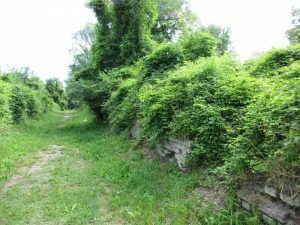 And then every now and then a property falling into ruins. The houses in these photos are literally next door to each other! 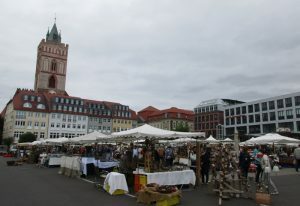 We arrived in the early afternoon – there was a ceramics market in the town square, we enjoyed some pea and lentil soup from one of the food stalls next to the market. 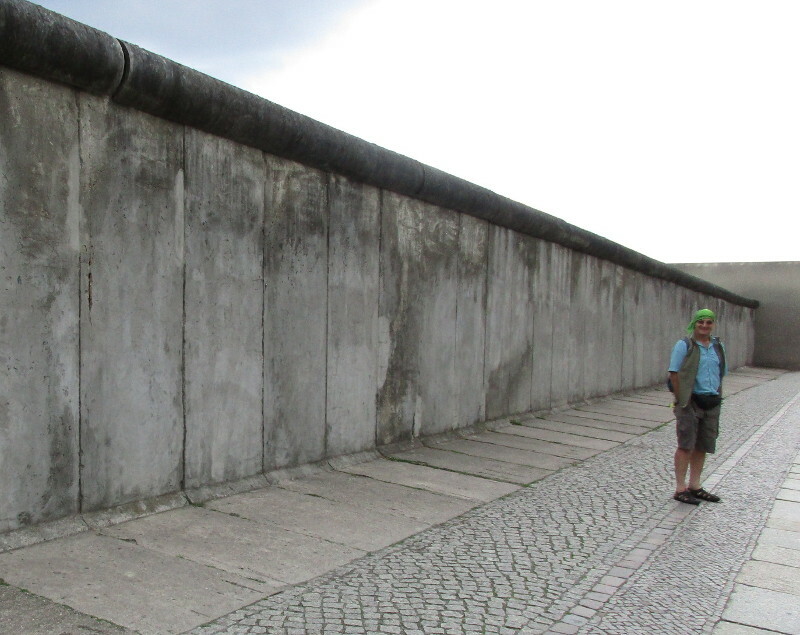 We had a good deal at a three star hotel – near the center of town. 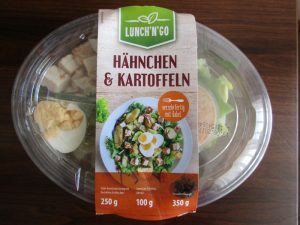 Finding good food is always of top importance when traveling by bicycle, as this is your fuel. 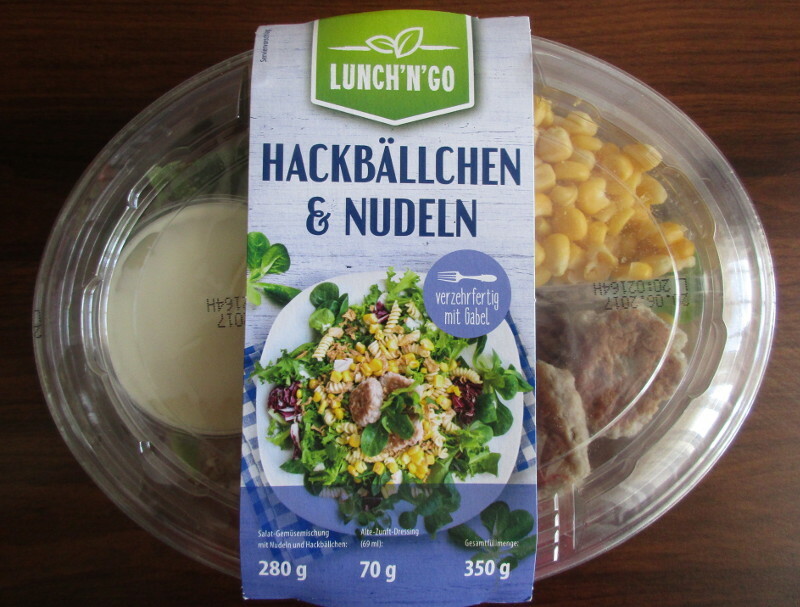 We tend to eat one large meal a day, mostly catered from the supermarket, and at the end of our ride. During the ride we may stop to eat a pastry, ice cream or other snack, but nothing too substantial. We really enjoy the ready made salads that can be bought in most German supermarkets and they have become a staple meal for us. They are substantial and cheap. Here are some photos of salads from Kaufland supermarket – these cost only 2.59 Euro each. Today we reached Poland. We rode 75km from Burg to Guben, and then across the border to the Polish side of the city (Gubin), where we are spending the night at the Hotel Onyx. 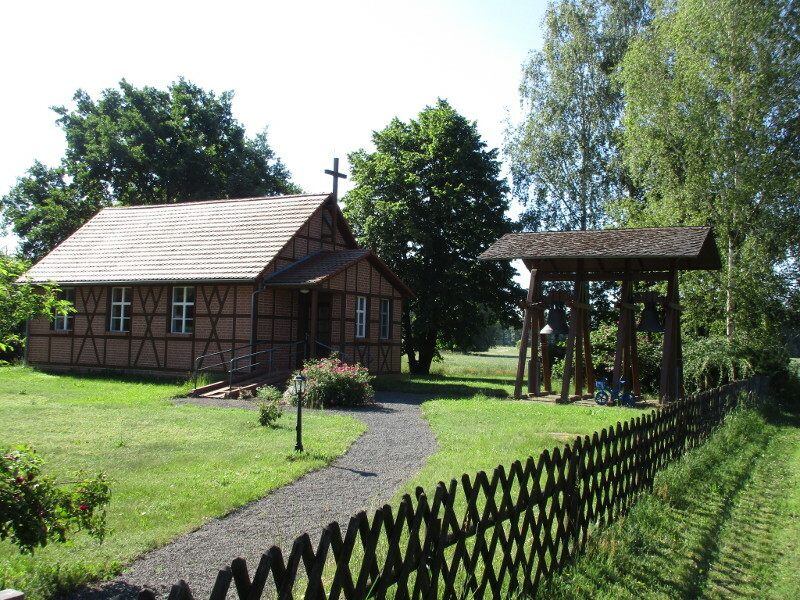 Accommodation is cheaper in Poland! 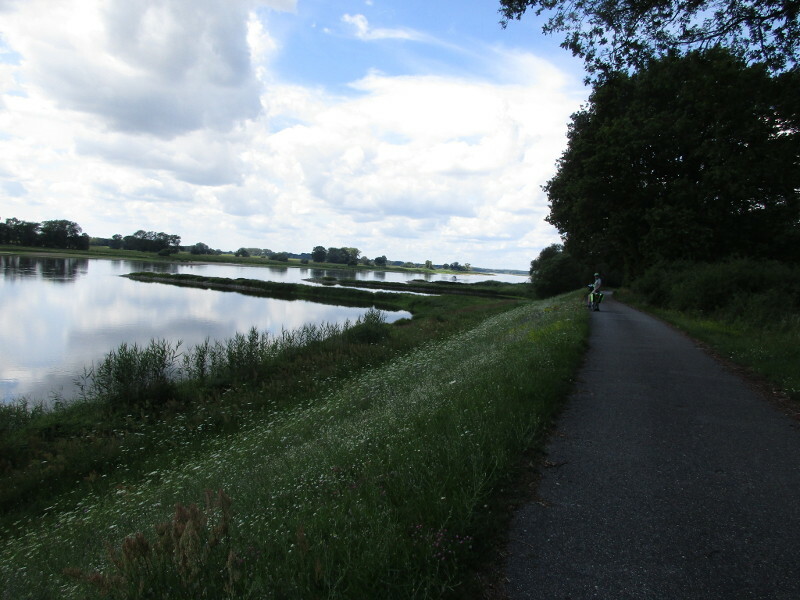 It was a day with lots of confusing roads criss crossing the canals – some on our map and some not. 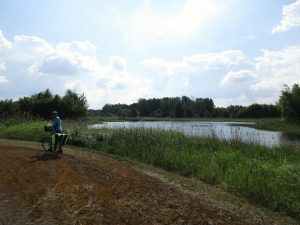 At one point Kris decided to take off into wet land nature reserve – a sign stated that there were water buffalo in the park and that we should not feed them, but we didn’t see any. Kris struggled to find a path out of the reserve, we didn’t want to back track back to where we came in. 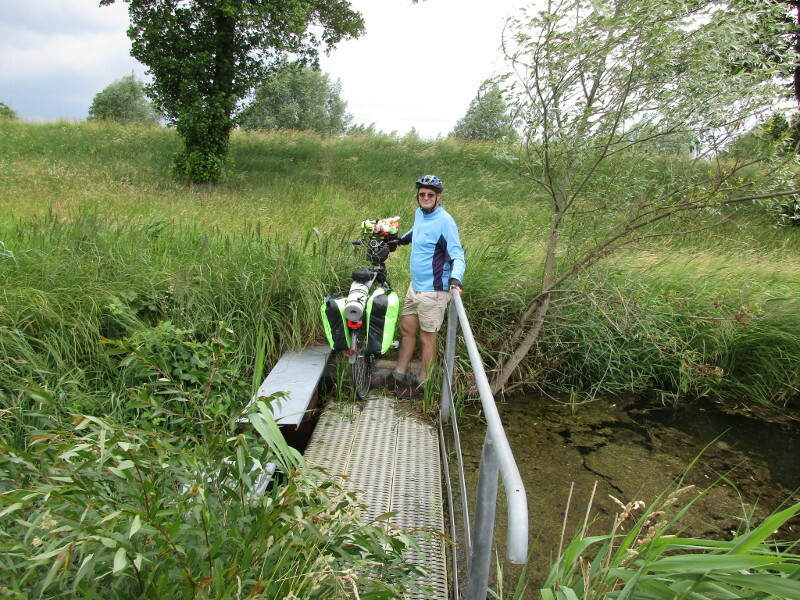 We eventually found a tiny little bridge across a river – sitting just above the water surface. From here we could ride along a stop bank to exit the reserve, more walking track than bicycle track. 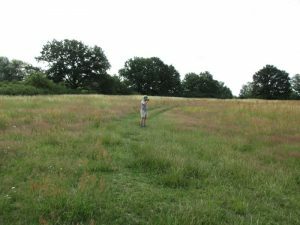 The sky grew rapidly darker as we left the reserve and a strong wind began to blow. It was the start of one of the summer thunderstorms you get here after a few hot days. Luckily we were out of the reserve and near a picnic shelter when it started raining heavily. 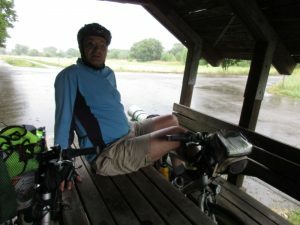 We ducked into the shelter with the bikes – Kris sat on top of the table and Jenny under the table. 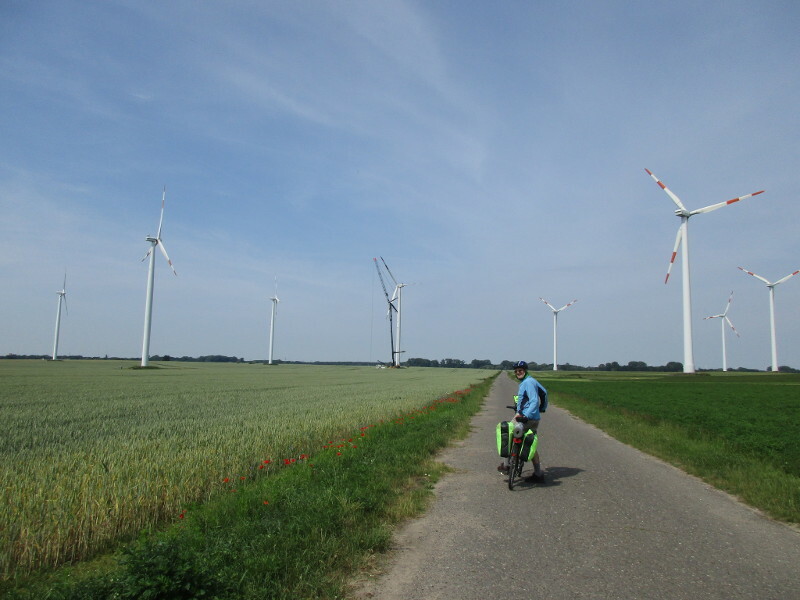 When the rain reduced we continued on – and found some random bicycle paths, We rode close to a huge power station with multiple cooling towers (near Janschwalde). 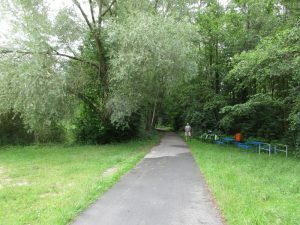 The rest of the route to Gubin was along small bicycle paths through forests. We did some shopping on the German side of Guben and then crossed into Poland across the bridge – the Neisse river is the border. 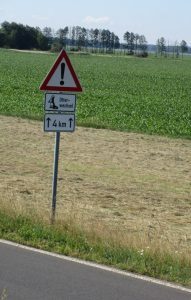 We had to ride a few kilometers into Poland to get to the hotel – the cycling infrastructure immediately deteriorates on crossing the border. We were struck by this parish church, next to the town hall, which has been in ruins since it was burnt out in the second world war. 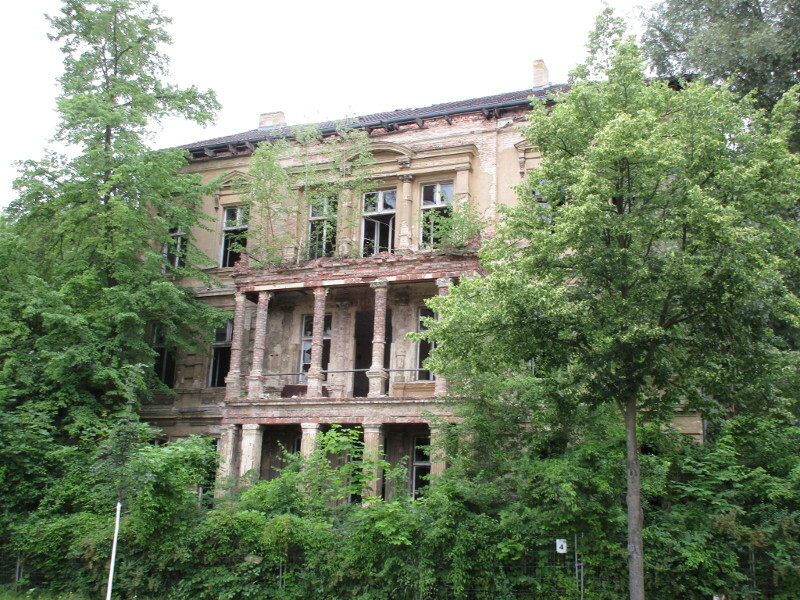 Restoration efforts started in 2005, but appear to be very slow. Our three star hotel is in a semi industrial area, but is otherwise pretty good with a big clean and modern room and a nice restaurant. Even though Poland is has its own currency, they don’t mind us paying in Euros. We had another heavy thunderstorm in the evening. 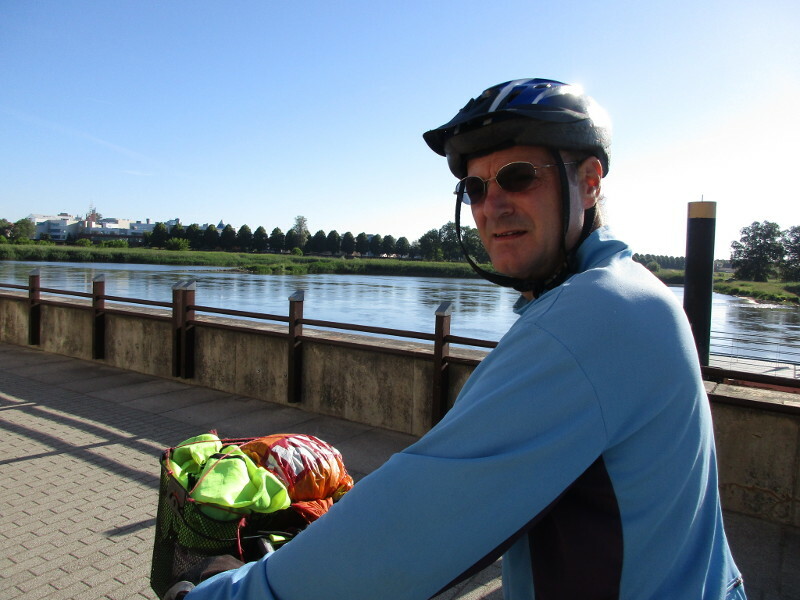 Today we made an early start at 7.30am – which was just as well as it got very hot later on. 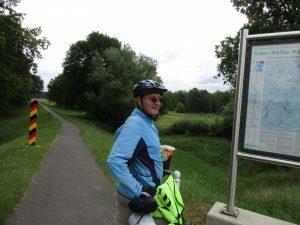 In all we rode 89km from Shonewalde to Burg in the Spreewald. Most of the journey was along straight flat roads, alongside wheat fields – with wind farms looming on the horizon every now and then. We passed through many small villages and some bigger towns. Starting off we took a route through Weizen, Meinzdorf, Herbersdorf, Ihlow – to the first biggish town Dahme – where we got a pastry from the Lidl supermarket for our breakfast. 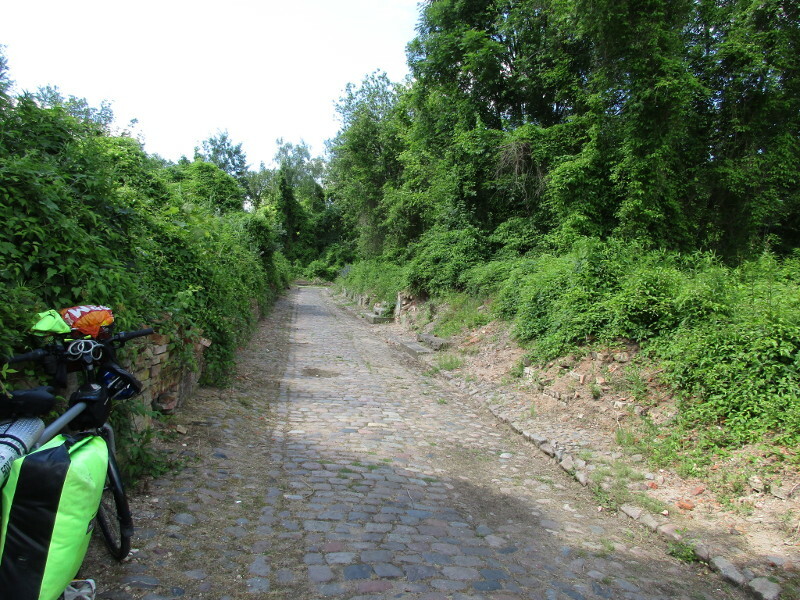 This old town had great cycling infrastructure, with bike paths built alongside some of the cobbled streets. 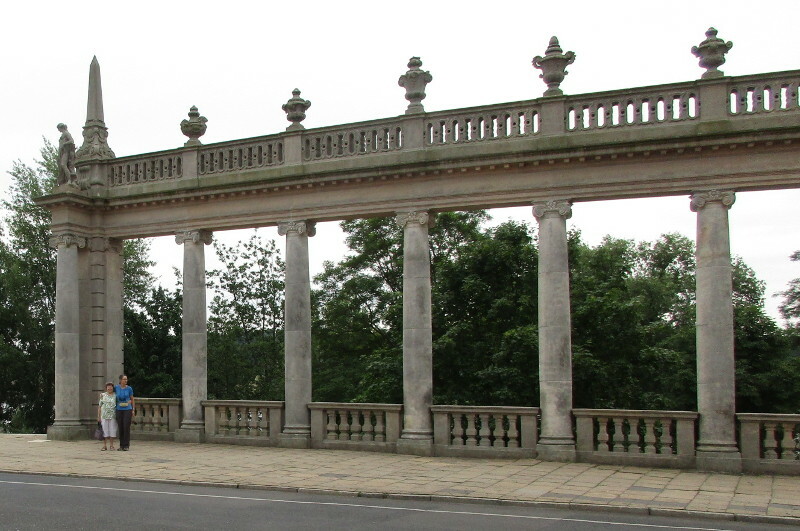 There were quite a number of older people out on their bicycles doing their morning shopping. Shortly after Dahme we got onto a good bicycle route that gave us a short cut to Kummritz. 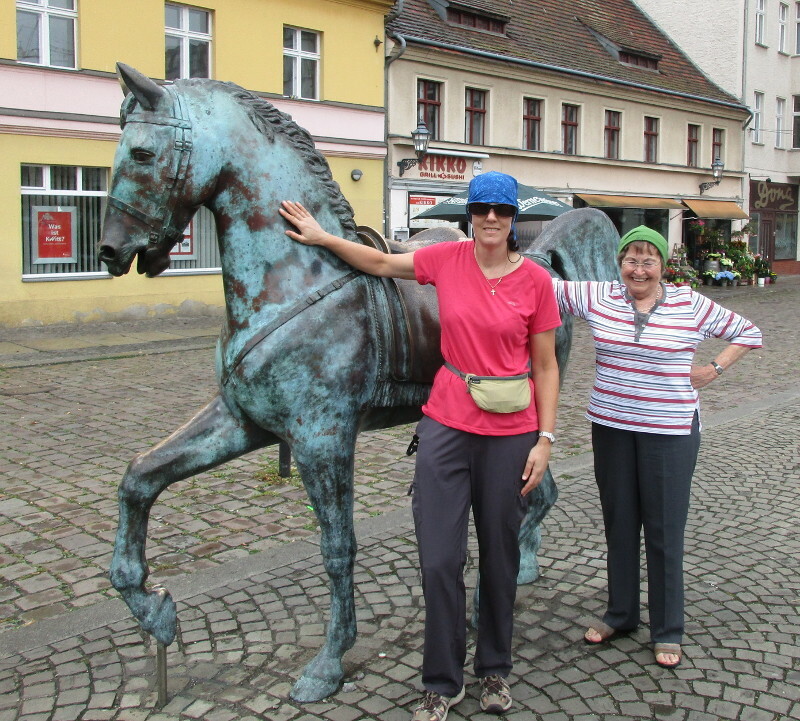 Then we made our way into Luckau, then Lubbenau. Lubbenau had many soviet era style apartment blocks – very neat but not pretty. From here we were skirting around the Spreewald – but couldn’t really see water. 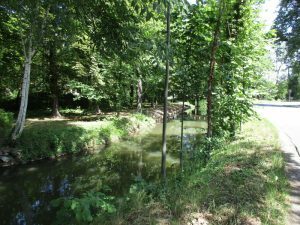 The Spreewald is a UNESCO biosphere reserve known for its traditional irrigation system, consisting of more than 200 small canals. It consists of wetlands and canals interspersed with agricultural fields. 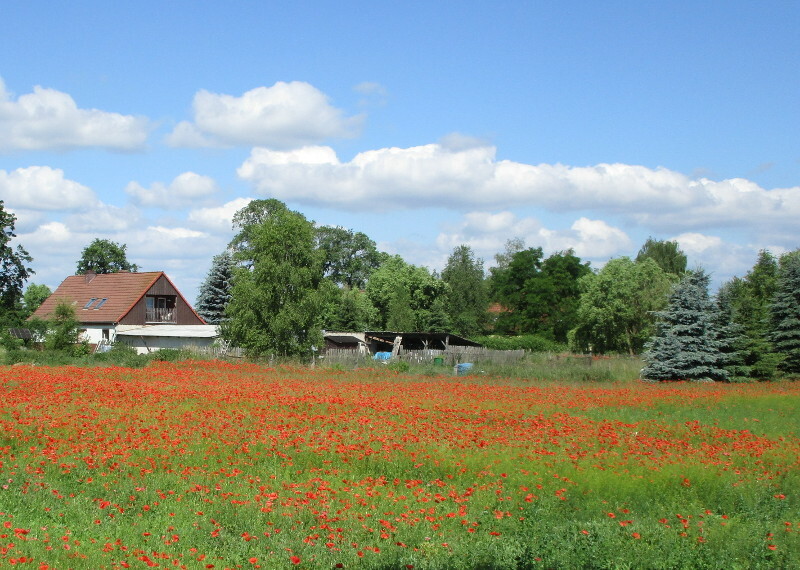 Tourism and agriculture are the main activities. 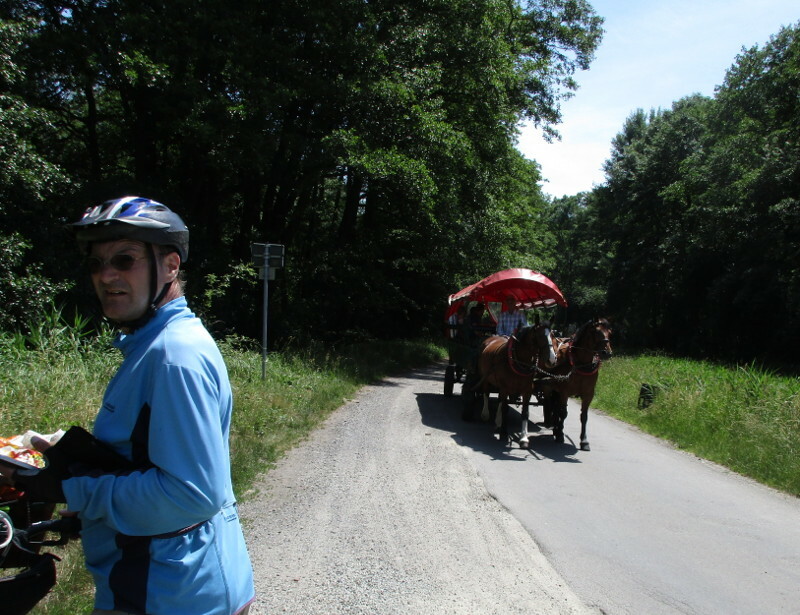 As we got closer to Berg we started to see some of the tourist activity, such as these people on a horse cart. We also saw a group on quad bikes. A little later on we saw some storks, including a nest with young. 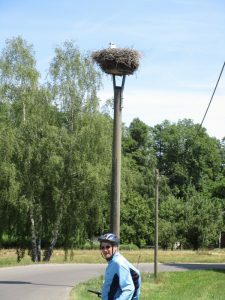 I love the fact that the nests are on poles especially erected for them. 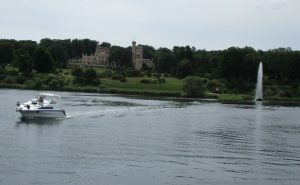 The canals are relatively narrow, good for kayaking and you can also take a ride on a gondola type tourist boat through. There is a “harbour” for these tourist boats at Berg. There are also many health and wellness type places around Berg, including a natural warm water spa. 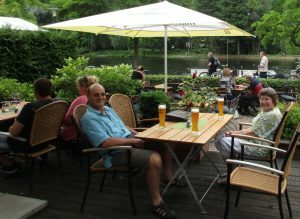 We just relaxed at the hotel, and drank a Weissebier on the veranda after exploring the town.